Gordon Mott, a 27-year veteran of M. Shanken Communications Inc., the publisher of Cigar Aficionado magazine, was named Habanos Man of the Year in the communications category on Friday night in Havana. Mott was handed the heavy trophy on stage in front of some 1,200 cigar retailers, distributors, executives and cigar lovers from around the world. His name was announced by Habanos S.A. co-presidents Luis Sánchez-Harguindey Pardo de Vera and Inocente Núñez at the PabExpo Convention Hall in Havana. Mott was formerly the executive editor of Cigar Aficionado, and he was there at the beginning, assisting editor and publisher Marvin R. Shanken on the creation of the magazine, which has been published continuously since Autumn 1992. He ran Cigar Aficionado for Shanken until 2014, when he moved to Mexico and took on the new role of senior contributing editor. He has traveled to Cuba more than 20 times covering the island nation for the magazine. His work on Cuba—particularly the extensive and illuminating reviews on Cuba's top hotels, restaurants and music clubs in the cover stories on Havana published by Cigar Aficionado in December 2011 and June 2015—has been among the more popular features published in the magazine's recent history. "I'm deeply honored to have won this award, and to join some of the greatest men in the cigar business who have received it before me," said Mott. "After 25 years reporting and writing about cigars, I know the special nature of the people in the industry, and I'm grateful to be a part of it." 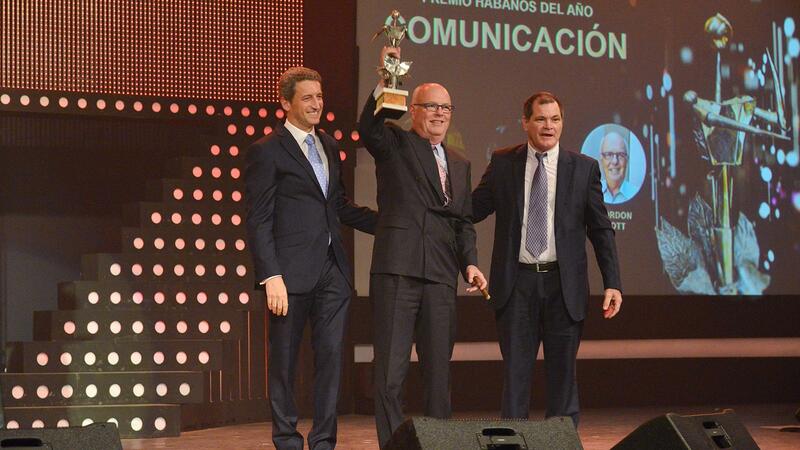 Habanos names three categories of Man of the Year at the Habanos Festival: production, business and communications. The production award was given to Josefa Acosta Ramos, a factory worker. The business award went to London retailer Edward Sahakian, who has owned the Davidoff shop on St. James Street for years and is one of the world's most experienced and learned tobacco retailers. Marvin R. Shanken, editor and publisher of Cigar Aficionado, was the first person to be named Habanos Man of the Year, in 1995.